A slow ballad style song, very short. This song was almost written in real time, I saw a girl at a party, who seemed to look toward me, no one else had noticed her. Unfortunately I was far too shy and awkward to approach her, so I was waiting for a stronger sign showing any interest, she may have had in me. |I left it too long and she walked into the kitchen, when she returned, someone beckoned her to them, my chance was gone, the saying is true, he who hesitates. The song obviously has a reverse in gender roles, as the vocals in the song are female. There's a magical quotient that's undeniable. 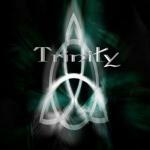 Trinity's "Unassuming Light" is a well built demo that has a significant potential to appeal to a wide audience. Bringing in live musicians and a more strong vocalist will better the song substantially. Very well done.